Home / Smart Vehicle Card / Vehicle Identification System / Vehicle Verification / How to get Smart Vehicle Identification Card? How to get Smart Vehicle Identification Card? After successful launch of Smart CNIC, chip based smart Vehicle Identification Card has just been introduced. These cards will takeover the existing vehicle registration books. This initiative has also been launched in collaboration with NADRA. It will not only good for the owner but also very helpful for law enforcing agencies. 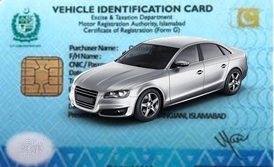 Excise and Taxation Department of Pakistan has started issuance of vehicle identification cards from 16 October, 2015. This credit card size card contains details about vehicle and its owner including; owner name, CNIC No., address, date of registration, chassis no., engine no., type of body, color, seating capacity, CC power, fitness examination validity, tax information and much more. All data is also stored in machine readable chip. This new system will help to overcome the problem of stolen vehicles with fake or tempered registration books as duplication of this new smart card is impossible due to its security features. In case the card is lost, it will be blocked immediately upon the owner complaint and a new card will be issued to the owner. I think it will be a golden chance for those people whose car is devalued or facing problem to sell it as they have not original book and have a duplicate copy. They may be able to issue new card after depositing old duplicate registration copy and applicable fee. Currently about 850,000 vehicles are registered with the excise department of Islamabad. How to get Vehicle Identification Card and its Fee? Excise and Taxation Department is issuing Vehicle Identification Cards for new vehicles at a cost of PKR 1450. Registration books of old vehicles can also be converted into this new card on request of the owner and upon paying the same fee as mentioned above. Buyer of a used vehicle will also get this new card instead of traditional registration book.